With summer weather finally hitting Southern California this past weekend, the last thing I want to do was spend it in a kitchen over a hot stove. 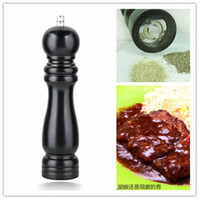 Consuming hot, steaming food seems less appealing, so the next option? Shave ice. It instantly cools the body and — if you’re not careful — can give a serious case of brain freeze. If you ever see “shaved ice” it’s wrong wrong WRONG. It must be “shave ice” for the authentic stuff. But where do we go for authentic shave ice in Hillcrest? A donut shop, of course. Donut Star is our local donut shop. It was originally owned by a young couple but recently changed hands and is now run by an Asian family. 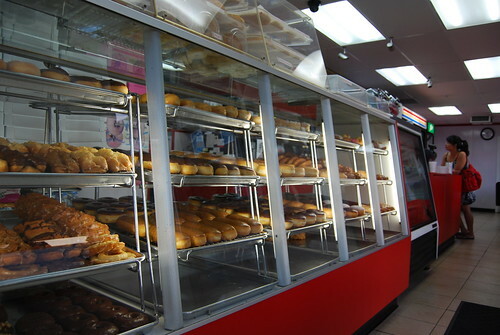 The new owners have expanded the selection from just donuts, bagels to croissants to also include boba drinks and shave ice. Donut Star offers up to three flavors for a shave ice. 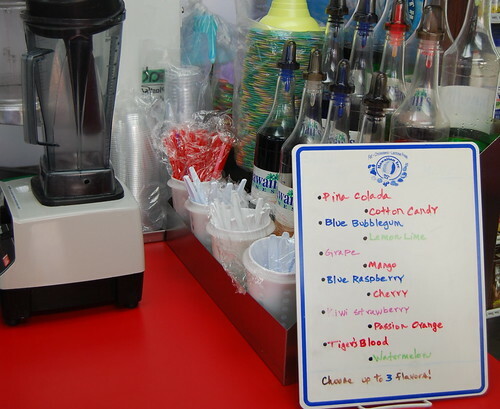 Our favorite flavors are cherry, piña colada and blue raspberry. Where blue raspberry is available in nature, I do not know. But it’s pretty when included with the red and yellow. Unfortunately, the grape flavor for this shave ice was an unappetizing inky gray. 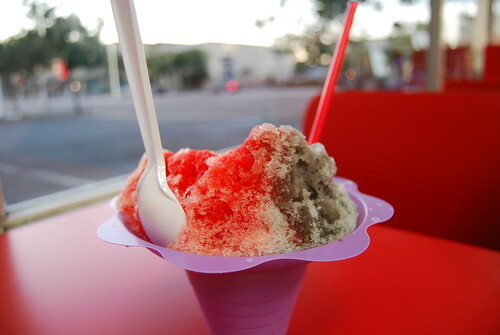 A large shave ice for $2.99 is a cheap alternative to air conditioning. Now bring on fall weather! At first I thought this was a different Donut Star. There’s one near my boyfriend’s apartment that sells donuts and Chinese food … it’s uh, not very good. I think your Donut Star is better than ours. All I have to say about this weather is thank god for AC. Huh. I was unaware there was more than one Donut Star. Chinese food and donuts usually isn’t a good indicator for the quality of donuts but I have been wrong before. is this near m-theory? gotta check this place out! 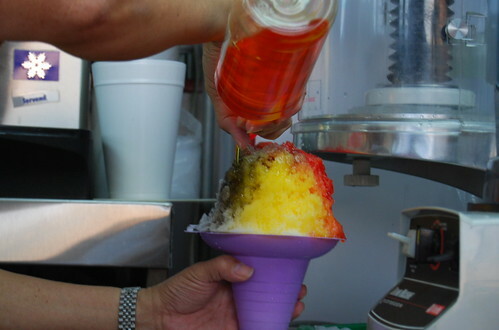 shave ice sounds so good right about now…. It is! About 4 blocks east of M-Theory. We were walking around last night taking down posters and had shave ice for dinner. 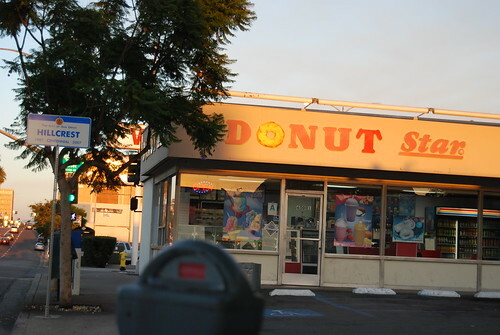 Hi Darlene, it’s been forever since I went in here, let alone bought any donuts recently. I’ll have to remember about the boba and shave ice. My place has no AC and I’ve seriously thought of sleeping in my car with engine running! I’ve had the same thoughts of sleeping in my car too. For a few days in San Diego, the heat is unbearable esp. for those of us that don’t have AC. I haven’t tried the boba drinks here. Yeah, I should have warned you that the shave ice is HUGE. Two grown adults like Paul and I can’t finish one cup between the two of us! So I wonder how much you go through one by yourself. Sausage King is closed Sundays and Mondays and they also sell “meat salad” which is pretty weird in my opinion. What CDs did you get? I bought a Star Trek LP on Saturday! My daughter and i only finish the top rounded part of the ice. after that it was overkill. In hindsight, we should have both gotten the smalls. I bought a Brian Setzer cd (can’t remember the title – it’s in my car right now) and The Smiths – Louder than Bombs. Even tho’ I have most of the songs on my ipod, I wanted to have the actual CD. They were having a “buy one used cd, get one free” special. I wonder if that dead just started today because my friend bought a Smiths CD the night of the signing. No one said, oh yeah, you can get one free. Bummer for her. i meant ‘deal’ not dead! duh on me!